Some of you... OK, many of you have noticed that I have been rather absentee from my blog and other social media lately. I'm writing today to offer my apologies and a little explanation. I've often written about my daughter on this blog -- she's my amigurumi muse and my inspiration. Most of my designs have been for her, in one way or another. The last six months have been hectic for us. My daughter started preschool in February. Back then, I was elated. I thought I was going to have more time to crochet -- more time to dedicate to The Itsy Bitsy Spider. And in some ways, I did have more time. Those few hours in the afternoon on school days have been a little slice of heaven for me. I guard that time jealously and give it up only when I absolutely must. As my daughter began to "get in the groove" with school, her needs also began to change. And so did her behaviors. My husband and I have known about our daughter's developmental delays since she first became a part of our family. Her gross motor and fine motor development were consistently between 4-6 months behind her peers and her speech was 10-12 months behind. Until recently, we blamed that on the conditions of her adoption and her expeirences living in a foreign country. As she began school, we realized that we needed more answers for our daughter. These types of answers would ensure that she got the services she needed. We sought out specialists. We had her tested. And, we received several diagnoses. In April, we found out that our daughter has a speech disorder known as Mixed Expressive Receptive Language Disorder (MERLD) and Sensory Processing Disorder (SPD). Then after an MRI last week, we discovered the root of these disorders -- a pre-birth brain injury known as Periventricular leukomalacia (PVL) and underdeveloped portions of the brain used to keeping and categorizing memories. 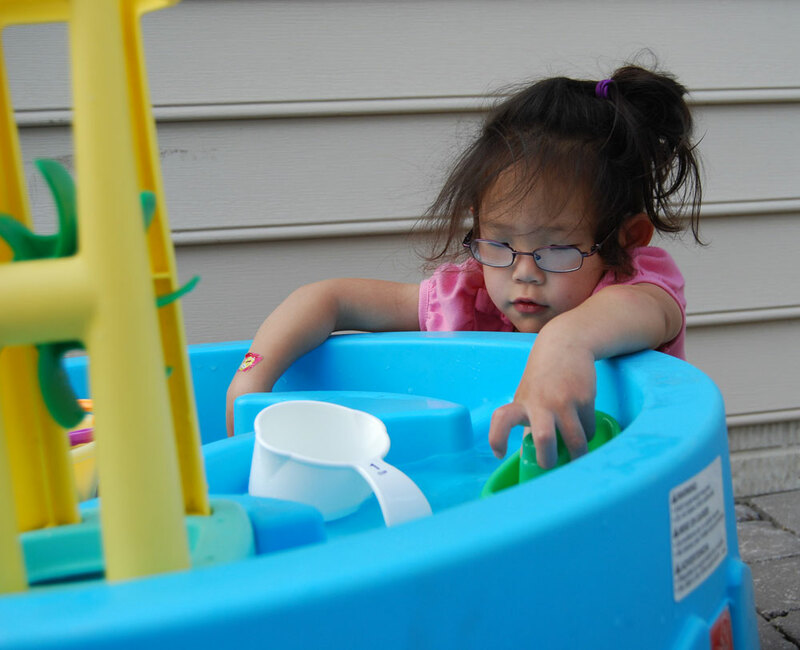 With my daughter's disabilities, early intervention is the key. Her neurologist was very positive when he gave her diagnosis and encouraged us that with the progress he's already seen from our daughter, he has no doubt that she is going to be able to get past a lot of difficulties -- in effect, to "re-train her brain to take over the functionality of the parts that have been injured." It's been intense. Every week we have speech therapy, occupational therapy, physical therapy, and behavioral therapy. In addition to shuttling my daughter between therapies, I've been making First-Then boards, visiual communication aids, practicing pretend play, and dozens of other activities designed to help her get to where she needs to be. There are some bright spots for The Itsy Bitsy Spider. My Angy Birds patterns have been even more popular than I ever expected. I've been using the money I've made from the sales to help defray the cost of therapies (I won't even go into the insureance situation). I can't begin to tell you all what a blessing your continued support for these designs has been. 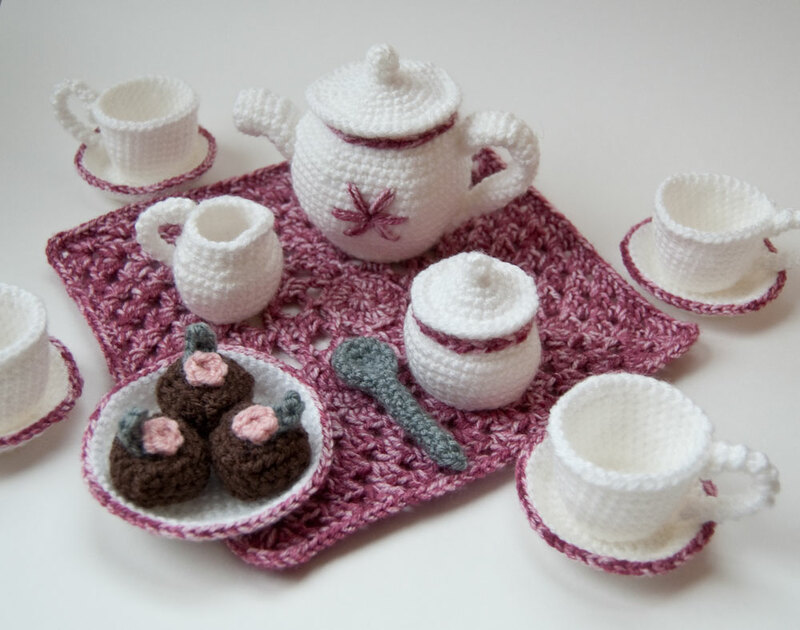 And, my amigurumi tea set is a finalist in the Vanna's Choice Challenge. I don't know when the winners are supposed to be announced, but any way it goes, I am pleased and honored to have gotten that far. I also just finished one of my biggest projects -- EVER for Voodoo Labs in Italy. Finally, I am working on a very special project for a group who has become very near and dear to me over the past few months -- the incredibly supportive community over at The SPD Blogger Network. In a nutshell, my friends, it's been a rough ride these last couple of months... but I am here. I still love each and every one of you and I still am doing my best to responde to all the emails, Etsy conversations, and Ravelry messages I receive. Your support keeps me crocheting and designing. Thank you. I am so cheering for your tea set. It is the cutest thing ever! I'm so glad to hear from you and what has been happening in your world. You are doing great work with you daughter. From a parent who has a child with a slight disability, putting the hard work in is so beneficial. My daughter is turning 21 tomorrow and to her credit is turning into a beautiful young lady despite her difficulties. Sweet Karla ~ despite the challenges your little angel is exactly where she is suppose to be, and so are you so she can teach you some of life's most important lessons. Good luck with everything! I'm sure you've got a bunch of helpful folk around you, but your public school system should cover a lot of the required therapies through the IDEA act (I'm pretty certain you are in the US, right?). So sorry to hear about your family's struggles. I love your designs and I think you are an extremely talented woman, so hang in there! It sounds like you've got everything on the right track with your daughter. I know it's exhausting-- my oldest son went through some occupational therapy when he was in preschool-- but it gets better and I'm sure she will be fine. Thanks for sharing. Sending you good vibes over the interwebs! Oh Karla, I wish you all the BEST and you are a wonderful mother for learning all that you can and helping her in every way! If there is anything at all I can do - any little thing - please ask! My sister just got her Masters in Speech Language Pathology - I wish I could donate her services to you! :) if we lived closer I would! You're in my thoughts - you all are! Wow--so much to take in. Glad to hear that you're able to help her in so many ways! Bless your heart. I just found your blog and patterns yesterday, and am enjoying catching up! We have 3 children with disabilities. Our 7yo biological son was diagnosed at 25 months of age with autism and sensory processing disorder. We began our journey as foster to adopt parents this past summer and have a 7yo son with Asperger's and also a 6yo son with Bipolar disorder. Kudos and prayers for your family on this journey with special needs.